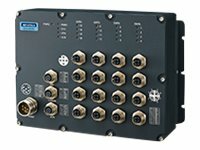 EKI-9516 M12 managed Ethernet switch is designed for railway applications, including rolling stock. EKI-9516 switch uses M12 connectors to ensure tight, robust connections, and to guarantee reliable operation against environmental disturbances, such as vibration and shock. In addition, EKI-9516DP provides a wide power input range; the dual, isolated power input increases the reliability of your communications system.